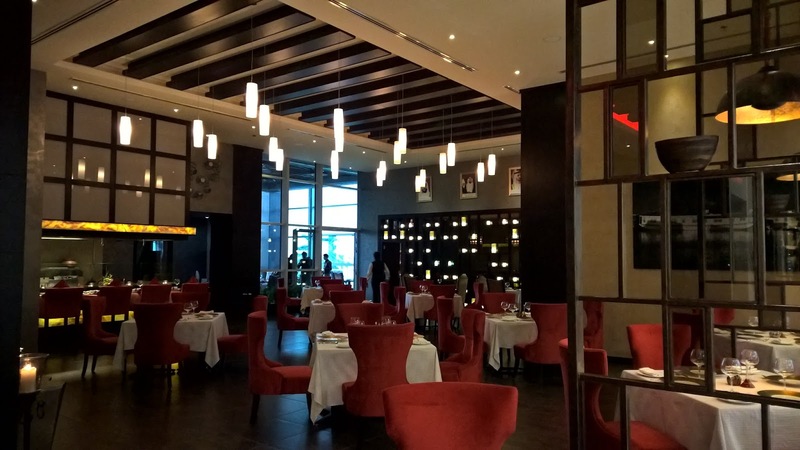 Forget everything you thought you knew about mall restaurants in Abu Dhabi. 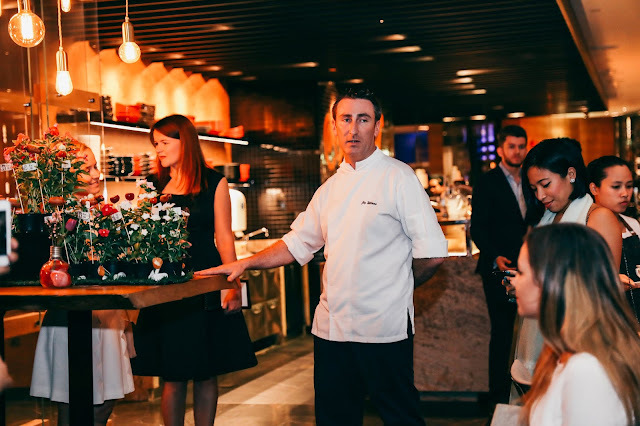 Let go of any preconceived notions that have formed in your mind regarding restaurants that are unlicensed to serve alcohol. 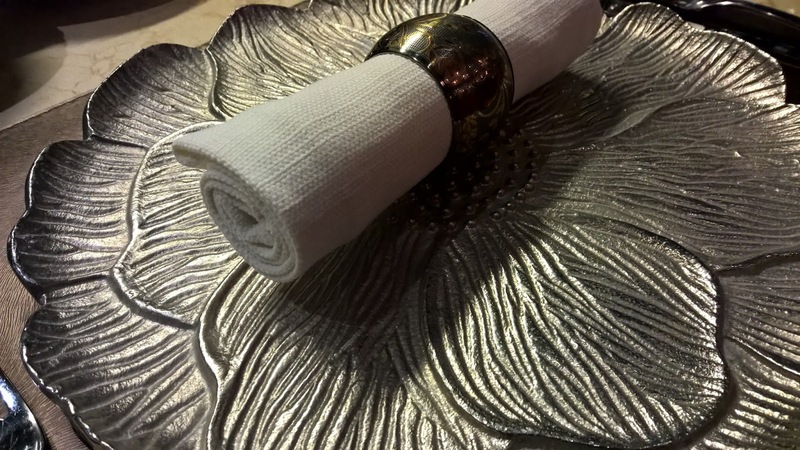 Signature by Celebrity Indian chef, Sanjeev Kapoor, is not your typical restaurant! Maybe it is the high ceilings that strike me as I walk in; or the spacious layout of tables and chairs. It could be the warmth radiated by the colours of the decor. Could it be the closed terrace seating that features floor to ceiling windows, bathing it in glorious, natural light. Whatever it is, Signature in Nation Galleria leaves me forgetting its mall location, and as the sun sets over the distant sea, I am immersed in a most pleasurable feeling. Accommodating around 120 guests, including 36 on the terrace, the restaurant does not feel big. It walks that delicate balance between being spacious yet intimate, without robbing you of a degree of privacy. For those with a bigger need for the latter, private dining rooms, exquisitely decorated, are also available. Papadums are served with a selection of yogurt, mint, kidney beans, shallots and indian pickles. We are also served a coco-litchi drink to start with. I am excited to know that they pair a drink with every course that is served. It is all about keeping the palate cleansed for the next course, I am told by our knowledgeable and well spoken waiter for the evening. 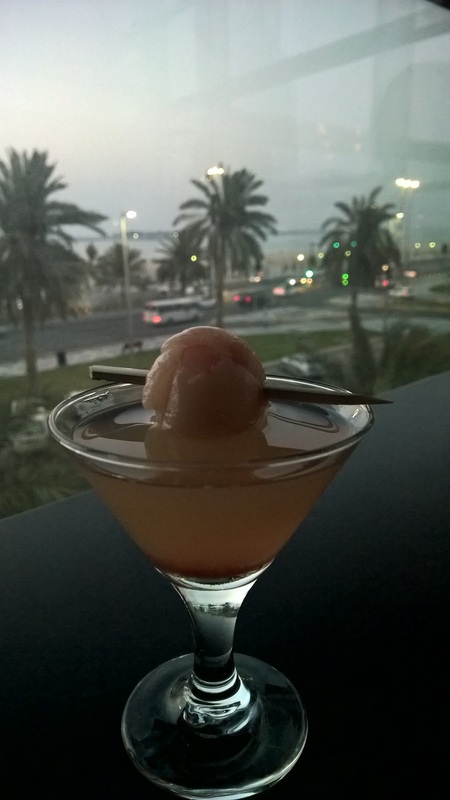 I cannot resist getting a pic of my drink against the corniche backdrop! 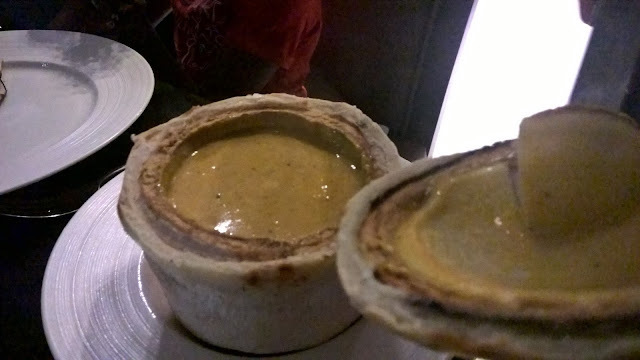 Soon after we are served the Dal shorba, or lentil soup - beautiful consistency that makes it a hearty starter to the evening. Poured at the table, it adds a theatrical element to the evening. In preparation for the next course, we are served a lemon and mint cleanser. As it is served, our waiter explains to us the choice of drink. Initial impressions I had that he was knowledgable continue. But it is not book knowledge - he relates to us in a conversational and matter-of-fact kind of way. 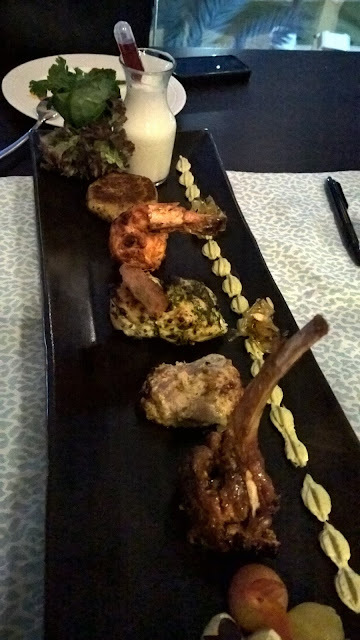 We are served tasting portions Lucknowi New Zealand lamb chops, Murg zatar parmesan tikka (chicken tikka), Guntur chili peppery prawns, Hamour and pesto and the Signature patthar ke kebab (lamb kebab). The portions are absolutely spot on in giving one a taste of a few starters while at the same time leaving one wanting more of the next course. Each taster has its own merits. 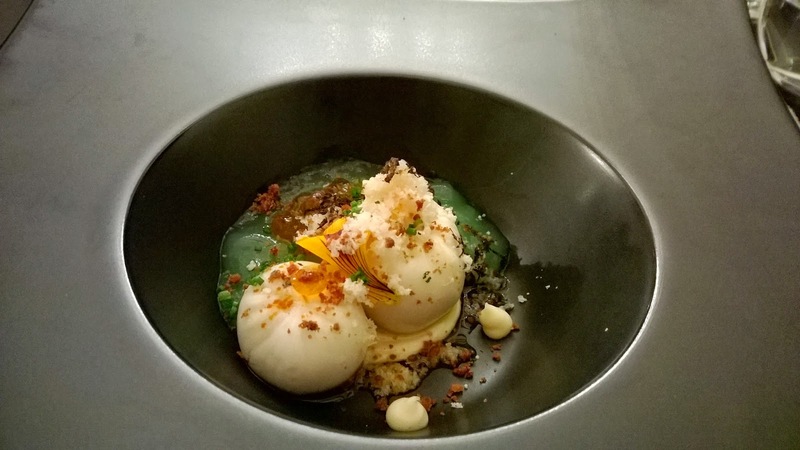 Chef Kapoor shows respect for local cuisine and tradition in very subtle ways. On the starting platter is a bit of hummus, very elegantly and unobtrusively placed. A very nice touch indeed. This comes through in a more obvious manner in the chicken and zataar with parmesan cheese. The juiciness of the chicken as well as that Arabic influence makes this one of my favourites on the plate. The lamb is just so tender, the tandoori prawn is bereft of rubberiness that characterises tandoori cooked prawns and as for the lamb kebab, the cardamon flavour that comes through lingers on the palate. Finally, what is more local than hamour and it is served very inventively with pesto! While it is slightly overcooked for my liking, the pesto moistens it up nicely. The accompanying lassi, playfully served with berry juice, hints at the simplicity and joy of childhood, I believe an important theme in the menu. Berry juice is left in a pipette and allows the guest to add it to the lassi. My daughter had a great time doing this - as did I! The service continues to be of a high standard, again taking one away from the idea that one is dining in a mall. Crumbs are periodically cleared away, but not in an obsequious, annoying manner where ones dining experience is ruined. Perfectly balanced! Before our next course is served, the Signature Sangria arrives. Pomegranate, orange juice and black tea combine with cinnamon and Fuji apple to create a wonderful drink. It is the black tea element that really excites me! I am now ready for the curries. 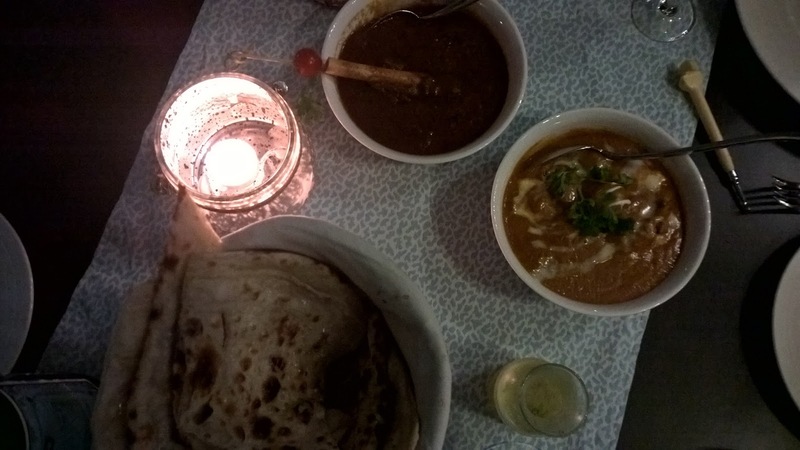 Signature Butter chicken, Lalla Musa dal, Nalli Rogan josh, Dum Naryali prawns and Hyderabadi gosht biryani are served. Whenever I go to an Indian restaurant, I look forward to seeing how a dish is interpreted. Even as my education continues, I am able to see some of the variations. The Butter chicken illustrates this. The mild sweetness that one usually gets is not here. Instead there is a mild spiciness that is the overwhelming taste left on the palate. The rest of the main dishes check all the boxes, but the stand out dish for me is the Lalla Musa dal which is just so decadently creamy thanks to a generous use of ghee! Highly recommended. Meanwhile the music has changed to Arabic. A lovely surprise, which make sense considering how many of the dishes have been infused with Arabian touches. The steady flow of local guests shows how popular Signature is because I believe it has embraced that which is local, while all the while showcasing its Indian roots. Our final cleanser is a real tour de force. A dome is brought to our table. 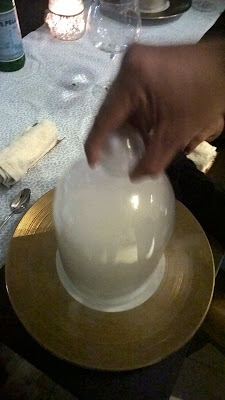 The waiter lifts and smoke billows forth to reveal Lassi. Again, the drama motif comes through. 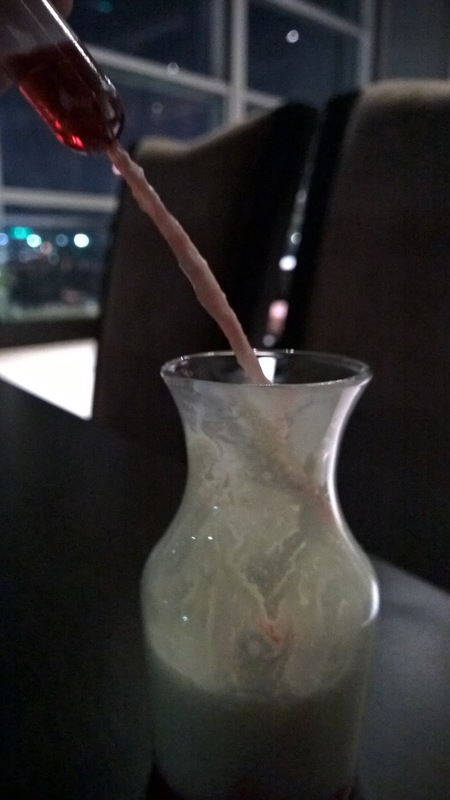 As for the taste - strong smokiness brings a different perspective to the lassi. Finally, dessert is brought to the table. 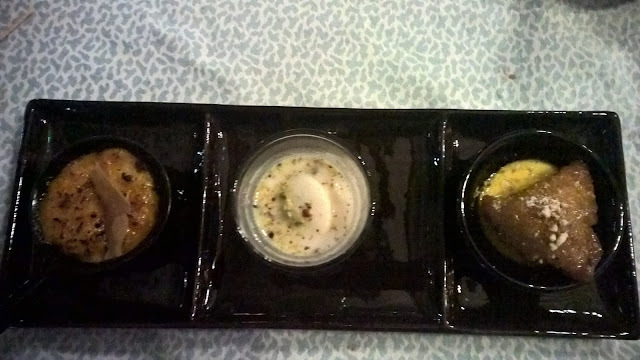 A platter that includes Gajrela umali, Ras Malai of course and Gulab jamun samosas. Inventive. However, if the lassi cleanser was theatrical, then the Electric kulfi is operatic! I will not say anything else. Even the menu describes it as 'Some surprise'. Suffice to say that it connects to the childhood theme picked up earlier with the lassi and berry juice. It is a joyous dessert that captivates and wows! For once dessert for me is not an afterthought, but an integral part of the creative energy that the menu possesses. When dinner ended, I felt I had dined at a special restaurant. 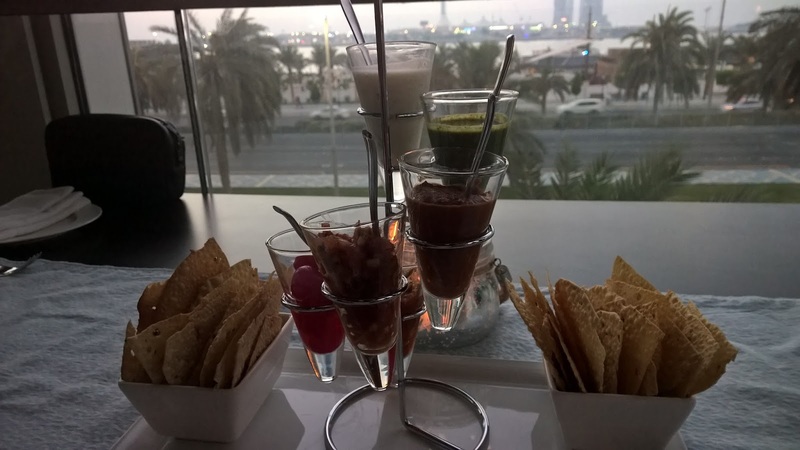 I often deplore the lack of creativity on plates in Abu Dhabi. It is more than creative plating. It is about breaking the rules. A few dishes showed me the breaking of those rules tonight - a welcome and refreshing experience. A self confessed wine lover, at the end it mattered not to me that I did not have any with my dinner. I am also someone who revels in situations where the boundaries are pushed - so that thrilled me this evening. Traditional, but with a foot in tomorrow. Disclaimer: I consult at restaurants and hotels in an attempt to look at the entire product to take service levels to where they should be. 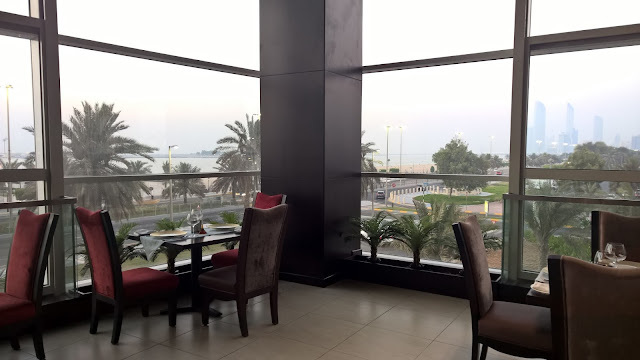 I visited Signature as a guest of the restaurant.